The SMART steel design software for structural calculations. 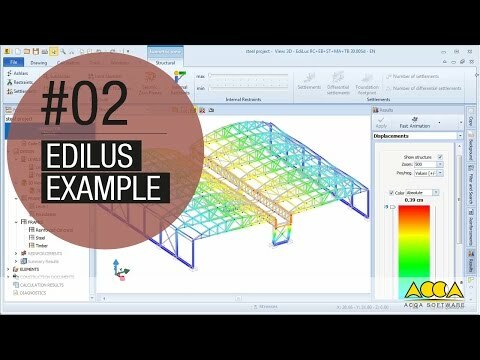 EdiLus-Steel is the SMART steel design software for the structural calculation of steel structures with a SMART BIM input, much easier and more effective. ACCA provides software solutions for the architecture, engineering and construction sectors.The simplicity and advanced technology that characterize ACCA’s software solutions, have revolutionized the construction industry by increasing productivity in the practices of hundreds of thousands of engineers, architects, surveyors, construction and installation companies, engineering departments, schools and universities. The software lets you design and verify entire steel constructions, calculate the individual elements within structures made with other materials (when integrated with EdiLus-Concrete or EdiLus-Masonry). With EdiLus-Steel you really have a SMART solution at the top for professionalism: BIM technology, an integrated solver, calculation of the entire structure and structural details, 3D simplified input, diagrams, graphical representations and automatic technical reports… A steel design software that lets you draw-up very complex structures, check every detail and produce working drawings, calculations and checks in a single design phase. Structural design with EdiLus-Steel is supported by “Magnetic Grids” that allow you to model a lattice of magnetic points in space of any shape and size. Each of these magnetic points simplifies insertion of structural members such as beams and columns directly in 3D. A 3D input that makes modelling extremely fast and accurate. With specific features, beams and columns can be inserted, moved and modified directly in the 3D view. To further simplify element insertion, the architectural plan, in DXF/DWG is shown directly in the 3D view and at the base of the magnetic grid. The integrated FEM solver provides a unified experience in structural design. In a single software you can go through input, calculation and analysis, introduce changes and launch printouts (diagrams, schedules and reports) in a simple and integrated manner. Each object can be viewed in terms of stresses, strain, and displacements. The calculation results can be viewed directly in 3D view, using color mapping covering bother members and connections. All structural elements and nodes with their construction details are automatically accounted for in a dynamic construction estimating software. Architecture and steel structures are now finally integrated… Thanks to the interaction between Edificius and EdiLus you can design and calculate with great awareness in a unified software environment.